A vast "raft" of volcanic rocks covering 10,000 sq miles (26,000 sq km) of ocean has been spotted by a New Zealand military aircraft. 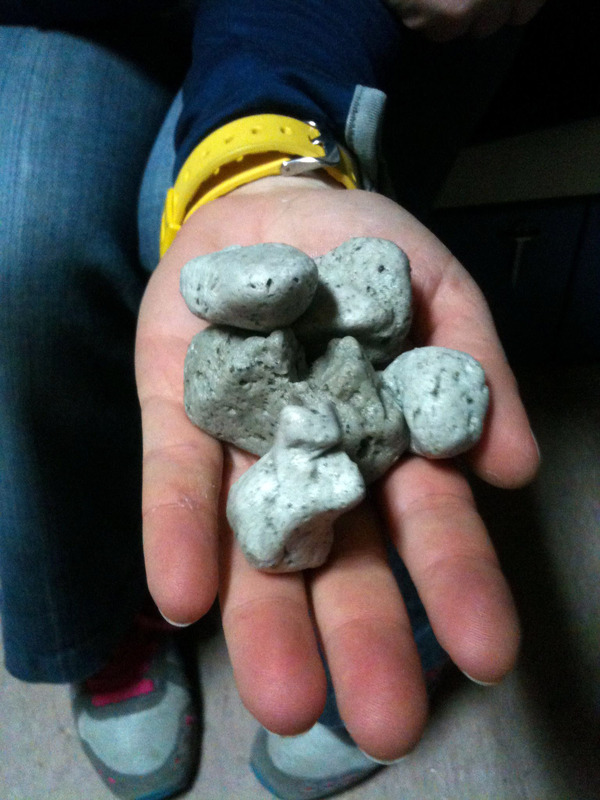 shows a handful of the rocks found floating in the South Pacific. One navy officer described it as the "weirdest thing" he had seen at sea. "As far ahead as I could observe was a raft of pumice moving up and down with the swell. "The [top of the] rock looked to be sitting two feet above the surface of the waves and lit up a brilliant white colour. It looked exactly like the edge of an ice shelf," the officer said. Researchers aboard the ship, HMNZS Canterbury, suggest that the source of the pumice was an underwater volcano (seamount) known as Monowai, located to the north of New Zealand. The pumice is likely to have been formed when lava from the seamount came into contact with seawater, and as it is less dense than water it quickly rises to the surface of the ocean. The Carabinieri dive team of Liguria examine a recovered amphora, or storage jar, found at the site of a 2,000-year-old Roman shipwreck off the coast of Italy near Genoa. The recovered amphora was a Dressel 1B type, produced in the kilns of Tuscany between the first century B.C. and A.D. the first century and was used for transporting wine. Test on some of the recovered jars revealed they contained pickled fish, grain, wine and oil. The foodstuffs were traded in Spain for other goods. The ship, which dates to sometime between the 1st Century B.C. and the 1st Century A.D., is hidden under layers of mud on the seabed, which has left the wreck and its cargo intact. The vessel will remain hidden at the bottom of the sea until Italian authorities decide whether to raise it or not. "Right now the area of the finding has been secured, and no fishing or water traffic is allowed," Lt. Col. Schilardi said. The discovery comes shortly after the same team found the Transylvania, an English liner that was sunk by a German submarine in May 1917 during World War I.
Hurricane Ivan was a classical, long-lived Cape Verde hurricane that reached Category 5 strength on the Saffir-Simpson Hurricane Scale three times. It was also the strongest hurricane on record that far southeast of the Lesser Antilles. There is an old expression that a hurricane is Mother Nature’s way of telling us that she is angry. But of course hurricanes are not just a byproduct of nature’s ire. This interactive mapping application easily searches and displays global tropical cyclone data. Users are able to query storms by the storm name, ZIP Code, city, state, geographic region, or latitude/longitude coordinates. Custom queries can track storms of interest and allow for data extraction and download. The GOES-13 satellite captured this stunning visible image of Hurricane Irene just before it made landfall in New York City in 2011. Tropical cyclones form all around the world, generally about 300 miles (480 kilometers) north or south of the equator. When they form in the Atlantic or Eastern Pacific, the storms are called hurricanes. They are called typhoons in the western North Pacific and cyclones in the South Pacific and Indian Ocean. The Atlantic hurricane season is from June through November, when the storms take shape on the coast of Africa. The Eastern Pacific season runs from mid-May through November. Typhoons occur year-round but peak in late August. In the South Pacific, the cyclone season begins in October and ends in May. In the Atlantic region, hurricanes form anywhere from the tropical central Atlantic to the Gulf of Mexico. There are distinct levels of progression as a storm becomes a hurricane. Once the winds reach 74 mph, it is classified as a hurricane and its intensity is measured by the Saffir-Simpson Scale. The Saffir-Simpson hurricane scale was developed in 1971 by civil engineer Herbert Saffir and meteorologist Bob Simpson, who at the time was director of the U.S. National Hurricane Center. The main parts of a hurricane are the rainbands, the eye and the eyewall. Air spirals in toward the center in a counter-clockwise pattern in the Northern Hemisphere (clockwise in the Southern Hemisphere) and out the top in the opposite direction. In the very center of the storm, air sinks, forming an "eye" that is mostly cloud-free and extends 20 to 40 miles (32 to 64 km) in diameter. The eye is surrounded by the eyewall, a ring of towering thunderstorms that inflict some of the storm’s most severe punishment. Curved bands of clouds and thunderstorms trail away from the eye wall in a spiral fashion. These rainbands can produce heavy bursts of rain and wind, as well as tornadoes. Tropical cyclones can get up to 300 miles (483 km) wide, but size is not necessarily an indication of intensity. A hurricane's destructive winds and rains can extend outward more than 150 miles (242 km). Winds are not the only hazard from tropical cyclones. Storm surges, when water is pushed toward the shore by the force of the winds, can increase the average water level 15 feet (4.5 meters) or more. Flooding also occurs, and in fact, causes most of the deaths during a tropical cyclone. More people are killed by floods than by any other weather-related cause. Since 1953, tropical storms have been named, first by the National Hurricane Center and now by the World Meteorological Organization. The organization maintains six lists of alphabetical names that are used in rotation and recycled every six years. There are separate lists for Atlantic, Eastern North Pacific, Central North Pacific and other zones. Names are retired after a particularly deadly or costly storm. Most recently, the names Wilma (2005), Rita (2005) and Katrina (2005) were among the names removed from the lists. Hundreds of small British fishing businesses are facing financial ruin, according to campaigners who are calling for radical reform of European fishing rules. They say their case revolves around one key statistic: that although small fishing boats account for 77% of the UK's fishing fleet and 65% of full-time employment in the industry, they are allowed access to only 4% of the fishing quota. The result of this apparent imbalance, says a new alliance of environmental activists and fishermen, is that the viability of boats under 10 metres long – and thereby classed by the EU as "inshore" operators – is increasingly under threat. Big fishing interests not only dominate the industry, but are also threatening fish stocks. This, they say, threatens the existence of fishing communities that go back centuries. In Hastings on the south coast, a fleet of 29 small fishing boats still operates from the beach known as the Stade, mainly catching cod, plaice and sole. The town's fishing industry is part of the south-east region, in which 339 small boats have access to a defined pool representing about 30% of the regional quota, while nine larger vessels control 70%. Local fishermen say that until 2006, they were effectively left to fish as they saw fit, but the introduction of a European register of buyers and sellers in 2006 marked the arrival of a much more stringent regime. Paul Joy, a local fisherman and co-chair of Nutfa (the New Under Ten Fishermen's Association), spoke to the Guardian for a film made as part of the Anywhere But Westminster series. In January, he says, he was monitored by a police helicopter while at sea, before his catch of cod was weighed and found to be slightly above his catch limit. Having already been fined £7,500 for exceeding his limit, he is waiting to hear whether he will be prosecuted. "If we were drug smugglers we'd understand it," he told the Guardian. "But we're just fishermen trying to earn a living, and with the quotas as they are, we can't." At the height of the cod season, in early winter, each boat's catch limit has been set at about 1.4kg a day, which represents less than a half a fish. "What we're allowed to catch doesn't even pay for the fuel to go out there and catch it," said Joy. "We've lost five or six weeks this summer because of the weather," said local fisherman John Griffin, 52. "You can't run a business like this. It'd be nice to tick over – but for the last few years, we've been on a deficit. Eventually, something's got to give." "We've got enough car parks and amusement arcades in Hastings," he said. "This fishery's been here for thousands of years and generations of people. To lose it would be crazy." This year sees a sweeping review of the EU's common fisheries policy (CFP), already the focus of campaigning by groups and individuals including Friends of the Earth, the WWF and the cook and Guardian writer Hugh Fearnley-Whittingstall. Now, the small fishing interests represented by Nutfa have united with Greenpeace to produce a Manifesto for Fair Fisheries, published today. It advocates granting "priority access" to such fish as cod, hake and monkfish to small fishermen, and allocating the quota "in a way which rewards sustainable fishing methods and protects coastal communities". Campaigners say the share of the quota given to small boats should be about 20%, but acknowledge the impossibility of such a change. The UK government has proposed reallocating unused quota, amounting to about 3% of the total, to small boats but the UK Association of Fish Producer Organisations – dominated by large-scale fishing interests – has applied for a judicial review. The Department for Environment, Food and Rural Affairs (Defra) said it was working with Nutfa on improving the way the quota is managed for smaller fishermen. Defra said the proposed reforms of the common fisheries policy would help small operators, because they should allow member states to take over management of their own quota, which would enable some of the interests of the smaller fleet to be prioritised. The European commission said it was also looking to the interests of smaller fleets, for instance by helping them gain access to more of the funds for improving vessels: the bigger a country's small fleet, the more financial assistance that member state would be allocated. A spokeswoman added: "The commission has also proposed that fishermen should be able to trade quotas between themselves so that the quotas can be used efficiently and flexibly. In such a system, the smaller vessels could be protected by having a part of the quota set aside for them." The CFP reforms were passed by member state ministers in June, but they must pass the European parliament too, and many MEPs of various countries have links with the big, industrialised fishing industries, so there are fears that the proposals may face a mauling. The fisheries commissioner, Maria Damanaki, has urged members of the public to make their views known, as public pressure has proved key to the passage of proposals to ban the wasteful practice of throwing edible fish back into the sea, dead. But thanks to compromises made to get the reform accepted, a full ban on discards of cod, haddock, plaice and sole will not be in place until 2018. Some of the fishermen represented by Nutfa claim they are mystified as to what they will then be intended to do with fish that are caught beyond their quota. A new submarine could pull off underwater maneuvers similar to aircraft flying stunts during a Lake Tahoe expedition in October. The makers of the DeepFlight Super Falcon hope to raise $45,000 through the crowd-funding website Kickstarter to test the boundaries of submarine technology. The two-seater submersible resembles a sleek missile or aircraft with wings, tail surfaces and ailerons —the brainchild of Graham Hawkes and Hawkes Ocean Technologies based near San Francisco. Such a sleek design allowed the Hawkes team to dream big and set the goal of pulling off a full underwater loop similar to what World War I fighter pilots pulled off during aerial dogfights. But the expedition to Lake Tahoe — bordering California and Nevada — has more than just underwater stunts in mind. The Hawkes team hopes the Kickstarter project can become the first public, crowd-funded underwater research expedition. That would also represent a first step toward "open-source" underwater exploration, in which the public decides everything from funding to selecting locations. Donate $5K to the Kickstarter project and get a ride on the wild side. Anyone wishing to ride as co-pilot aboard the Super Falcon during the Lake Tahoe dives can reserve one of the limited spots by donating either $5,000 (three available spots) or $10,000 (two available spots) on Kickstarter. But even lesser donations such as $100 come with rewards such as an invitation to see the submersibles launch. Getting a ride on the wild side of submersibles doesn't come without some limits. People who earn the right to dive with the submarine must weigh less than 220 pounds and have a height shorter than 6 feet 4 inches — and they must sign the inevitable waiver. Hawkes previously built the DeepFlight Challenger submarine for adventurer Steven Fossett, which is now owned by billionaire Richard Branson's Virgin Oceanic. Branson's company plans to use that single-person submarine in its attempts to reach the deepest points of the world's five oceans. The 35-year-old, who also won silver in 1996, overtakes Dane Paul Elvstrom, who won four golds up to 1960. 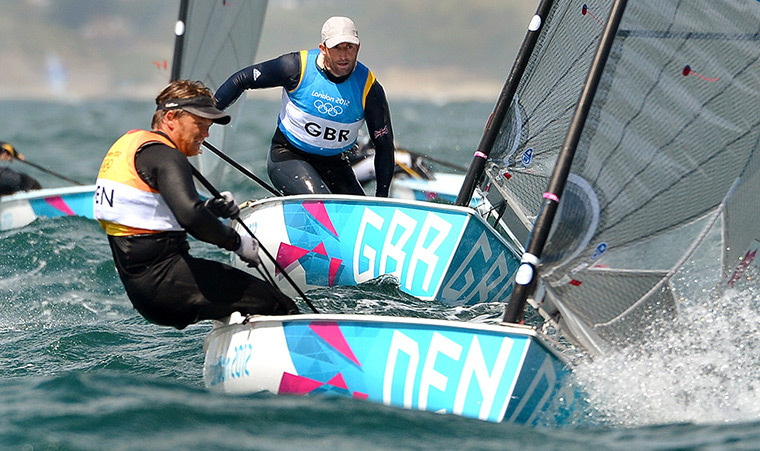 Britain's Ainslie came ninth in a tense Finn medal race to edge long-time regatta leader Jonas Hogh-Christensen of Denmark into silver. France's Jonathan Lobert won the medal race to grab bronze from the Netherlands' Pieter-Jan Postma. Ainslie was handed a union jack and a flare after crossing the line and sailed past the huge, cheering crowds on the Weymouth shore. 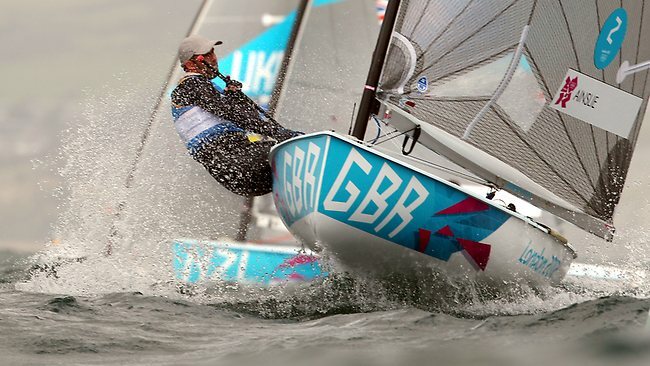 "It's times like this you are supposed to come out with something clever but I can't think of anything," said Ainslie, who won silver and gold in the Laser class before switching to the heavyweight Finn dinghy to win further Olympic titles in Athens and Beijing. "I am speechless. I am just so glad for everyone who has supported me over the last four years. It has been an amazing Olympics. "After six races I was in a bit of trouble. Thankfully I turned things around and got it right when it counted. "It's been incredibly hard - there's a huge amount of pressure to perform at a home Games. It's been the hardest couple of weeks of my life but you just have to get on with the job. "This was one of the hardest courses I have raced on and I don't want to do anything like that again." Ainslie had trailed Hogh-Christensen all week and had not beaten the Dane until the seventh race of the regatta. He narrowed the gap to just two points on the final day of fleet racing and went into the medal race needing to finish ahead of Hogh-Christensen, and in the top six if Postma won. Most observers expected an aggressive match-race between Ainslie and Hogh-Christensen and the Briton tracking his rival around the committee boat in the pre-start manoeuvring. Ainslie got a slow start before sailing off to the right side of the course, which he had identified as being where there was most wind. He went around the first mark in fifth, with Postma behind him and the Dane in ninth. Ainslie climbed to second at the first downwind mark but then slipped back to join Hogh-Christensen at the back of the fleet. But the Briton was perilously close to losing gold with Postma in third and attacking New Zealand for second. Postma, though, hit Kiwi Dan Slater's boat on the final upwind leg and had to take a penalty turn which dropped him to fifth at the finish. Ainslie and Hogh-Christensen came home ninth and 10th and the Briton's coronation was confirmed. "You can never say never but I don't think I can sail one of these again, it's killing my body," said Ainslie. " I don't think you will see me in Rio [for the 2016 Olympics]. But it's the best way to bow out at a home Olympics. "I learned to sail for fun so it's been a long road but I have had a lot of support over the years and I am just so glad to have done it." Sea surface temperature (SST) simulation from GFDL's high resolution coupled atmosphere-ocean model. A fascinating animation by two scientists shows how the surface temperature of the sea varies across the world throughout the year. Created by the Geophysical Fluid Dynamics Laboratory at the National Oceanic and Atmospheric Administration (GFDL), the graphic illustrates the ever-changing temperature of our oceans. It’s as if Earth had an invisible heart beat showing through the surface temperature of our oceans. Beautiful.